My grandmother, Hazel, is 95 years old and going strong. 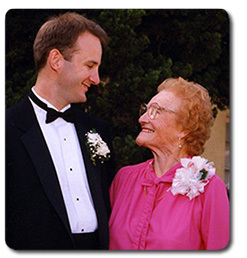 We came to realize that she is the only keeper of much of our family history, and the only one who can identify many of the people in our family photos. So we engaged Jane and Peter of Your Story Here to document her life. I thought I knew my grandmother quite well, but Jane and Peter's detailed and thoughtful process brought out the story of her life in a way I hadn't imagined, and which will be a family treasure forever. 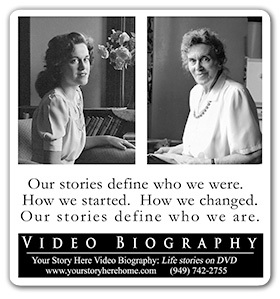 Through a process of pre-interviewing me and Hazel, and of going through over 100 family photos, Jane was able to build a basic outline of Hazel's life to guide her through the actual video interview. Because she was so well prepared, she was able to ask the right questions throughout the taping to bring out layers and textures from Hazel's life story instead of just a telling of events. As for our family photographs, Peter not only scanned them all in and edited them into the video at all the right points, but he also used technology to clean up the cracks and discolorations so the pictures actually look better in the video than when you look at them directly. In addition, Jane and Peter added historical photographs depicting events Hazel was describing but of which we have no pictures of our own. For example, Hazel described the tent city her parents lived in after the 1906 San Francisco earthquake, and as she describes it we see on screen pictures of an actual tent city from that event. Jane was even able to record Hazel's answering machine message, which she hasn't changed in 20 years, and include it playing over the closing credits. A great touch! The final product flows very smoothly from Hazel's earliest memories through her current perspectives on a long life and the world today. It is the story of her life, fit deftly into the context of the times in which she has lived. I can see now that any attempt to do this on my own would have come up woefully short. Jane and Peter produce a professional documentary of a quality that an amateur cannot match. Of course Hazel will pass one day, but our family has such joy in knowing that we have preserved her voice, her smile, and her stories on video. We have them to enjoy and to share with our kids and their kids. That is truly priceless. I highly recommend Your Story Here to anyone who has a parent, grandparent or any older person in their lives who has a story to tell. I believe everyone has a story to tell, they just need someone to ask them the right questions. Call Jane and Peter and have them put Your Story Here. Some time ago we created a video biography for Hazel G.
She was a delight. Lively, sharp, and a total optimist. So we started the video with something she had said during the interview. She had said that she was like Pollyanna - in the famous 1913 story. She always believed in looking for the best in a situation - something to be glad about. Her family were delighted with our work. Her son Alan sent us a nice letter recently that is the one of best recommendation we could have received.